Retina Health Center is now offering Jetrea, a new non-surgical treatment option for patients with symptomatic vitreomacular adhesion (VMA), a progressive, debilitating eye disease. Left untreated, VMA may lead to visual distortion, loss in visual acuity and central blindness. Recently approved the U.S. Food and Drug Administration (FDA), Jetrea is the first drug approved to treat VMA. 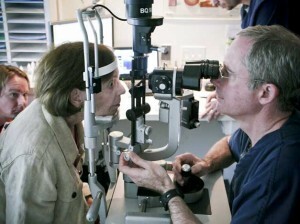 The medication is injected into the patient’s affected eye once as a single dose. The alternative treatment for VMA is a surgical procedure called a vitrectomy. VMA can contribute to eye problems if the vitreous (the jelly in the center of the eye) starts to move away from the macula (the center of the retina responsible for reading vision). This movement can lead to damage of the macula due to pulling or tugging on the macula. Jetrea is an enzyme that breaks down the proteins in the eye responsible for VMA. The drug allows the vitrous and macula to separate properly and reduces the likelihood of tugging. Retina Health Center and the Macular Degeneration Research Center were established in 1993 by Dr. Alexander M. Eaton, a long-time Southwest Florida resident who has been practicing ophthalmology in Lee and Collier counties for more than 17 years. Eaton has been the principal investigator for numerous studies to prevent and treat macular degeneration, diabetic retinopathy, branch and central retinal vein occlusion. For more information on the latest studies or to make an appointment, call 239-337-3337 in Fort Myers or 239-793-5200 in Naples.